Published: December 27, 2013 17:00 By Manjari Saxena, Deputy Editor The weekend tabloid! 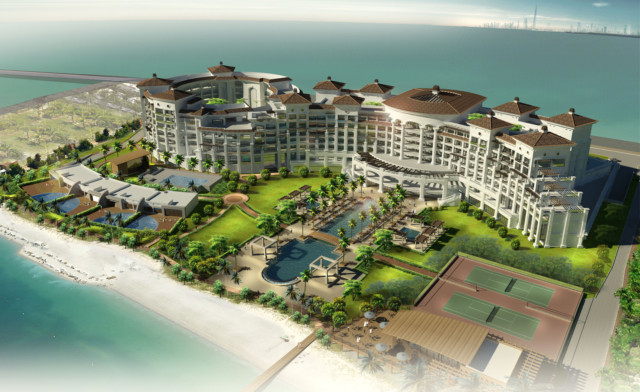 On the right hand frond of The Palm Jumeirah, beyond Atlantis The Palm, The Waldorf Astoria, Hilton Worldwide’s luxurious brand and one of the world’s most prestigious hotel chains in the world is all set to open its doors in January. A select media set was invited for a sneak preview earlier this month to the white, red-roofed property which has a private beach lagoon beyond well-appointed (still under construction) garden area. Guests will find some of the largest standard rooms in the world with gorgeous views of the Arabian Gulf and Dubai skyline — including the Burj Khalifa — and the Waldorf Astoria trademark clock that greets guests just as they enter the lobby. What one would fall in love with is the spacious white marble bathroom that features a double vanity, a bathtub and a rain shower. The hotel also includes the Club floor for long-standing loyal members of the brand with an exclusive access to the Club Lounge. However, just as the suites, this was still not available for viewing. The hotel houses three speciality restaurants including Lao serving Asian cuisine, the Mezzerie — where journalists were served a sumptuous and tasty international buffet, with focus on Arabic and Moroccan cuisine — and an unnamed European eatery which shall be helmed by a top-rated chef still to be announced. Apart from this an elegant Venetian-themed bar Serefina will bring an old-world touch to the contemporary-styled property. A contemporary fitness centre, 2,000 square metres luxury spa, two temperature-controlled swimming pools and supervised Kids’ Club will also be available to guests.